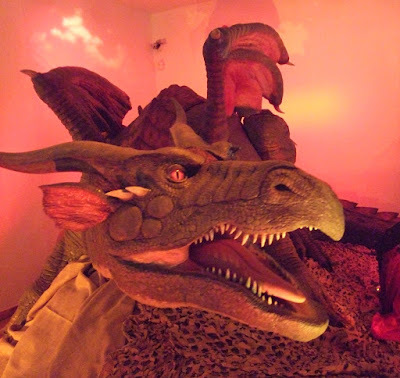 A bad witch's blog: Seriously Monstrous: Dragons - More Than a Myth? Seriously Monstrous: Dragons - More Than a Myth? 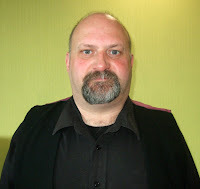 At Seriously Monstrous - a one-day conference on cryptozoology - last weekend, one of the talks was Dragons - More Than a Myth by Richard Freeman. Dragons are the grandfather of all monsters. They are in the most ancient legends of the human race and can be traced by folklorists to Africa, before our ancestors left that continent. As Richard said: "The dragon has his claws deep in the psyche of humanity and is not about to let go." The western dragon is a reptile with four legs and breathes fire. They are gods or the enemies of gods in early tales and are only later depicted as being mortal creatures. In western myths and legends they are usually evil and often have special powers. Wyverns are similar to dragons but have two legs, are smaller and less smart. The wyrm is also common in tales across Europe and Scandinavia. It is limbless, spits poison and, if cut up, the pieces rejoin. The basilisk is another similar fabulous beast. It is supposedly hatched from a cockerel's egg and incubated by a toad or snake. Looking in a basilisk's eye meant death. It was defeated by showing it its own reflection - or the sound of a cockerel crowing at dawn. A bit like a basilisk, the cockatrice looks birdlike and has a deadly gaze. In the Orient dragons are associated with water rather than fire. 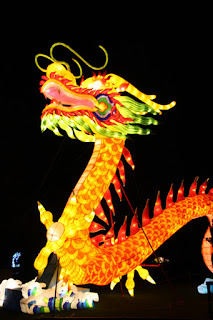 Chinese dragons have four legs. They do breathe fire, but it condenses and turns to rain. They are usually benevolent. They start life as snakes, but grow enormous over centuries, also growing wings. The katsu is a Japanese dragon. It has three claws and grows more quickly. It is generally benevolent. The naga is from Asia. In India the naga is depicted as half human, but originally nagas were giant serpents. The Persian dragon is a hybrid of eastern and western types. It looks eastern, but breathes fire and is evil. In China, dragons are said to shed their bones as well as thier skin - although, of course, what are found are dinosaur bones. These bones were thought to have magical and medical powers. However, there are stories of people interacting with dragons, which is odd if the dinosaurs died out before humans evolved and if all humans ever found were bones. What living animal could have inspired tales of dragons? The salt water crocodile is the biggest living reptile. 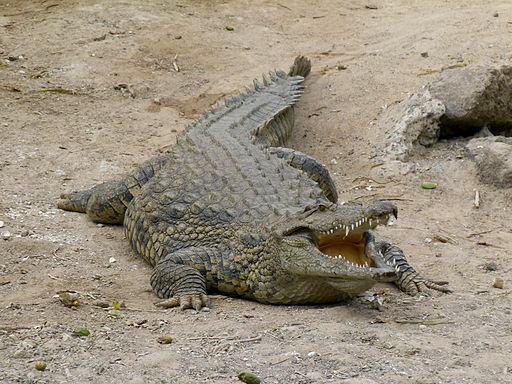 So, colossal crocodiles could be the answer. They kill large animals. Coins are thrown to appease crocodiles in some cultures, which could explains stories of dragons' hordes of gold. The largest known lizard is the Komodo dragon. It is venomous and gives a festering bite then waits for its prey to die. These had prehistoric ancestors that were much larger and there are still stories of giant lizards being sighted. In New Guinea there are stories of fire-breathing giant lizards in modern times, although the fire is actually their red tongues. However, they are still very large. The reticulated python is huge - a 33ft long python was recorded in the 1930s. Another giant snake is the green anaconda. It is much bulkier than the python. Giant reptiles today are all tropical, but some could perhaps have been brought to the west in menageries. A book in the 1970s called The Flight of Dragons suggested ancient reptiles might have been like derigibles filled with hydrogen and could have breathed fire. This is the idea that there is a template of monsters in the human psyche, because similar monsters are found in tales all over the world. The global monster template includes fairy folk, demonic dogs, phantom cats and the king of all monsters - dragons. The templates are distorted analogues of what preyed upon or competed with the ancestors of homo sapiens - big crocodiles and other giant animals. So, we have fears deep in our psyche. But, there could be more to it than just resurfacing fears. The Tibetans believe in tulpas - artificial ghosts. People can create visible tulpas from their thoughts. Maybe our minds are creating tulpas of ancient fears, such as monsters. Another theory put forward by some is that dragons could be creatures from another dimension. Seriously Monstrous was organised by Assap at Holiday Inn Bristol City Centre on Sunday 21 May.